art museum in Washington, D.C. In 2008, Stephen Colbert was able to hang his portrait in the National Portrait Gallery, in the "historic alcove" between the bathrooms and above the water fountains. 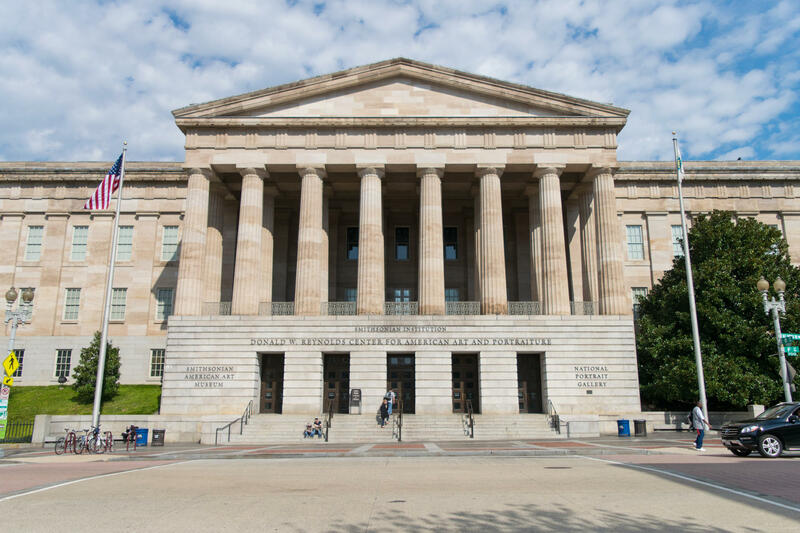 The building that now houses the Smithsonian's National Portrait Gallery and American Art Museum was originally used for the Patent Office. The National Portrait Gallery's renovation, completed in 2006, cost $283 million. Remind me who that is? My love for my first internship with the National Portrait Gallery will never die. Before the museums moved in, this building served as a patent office, a military barrack, a hospital and morgue (during the Civil War), the venue for Lincoln's second inaugural ball, another patent office, the Civil Service Commission, and many more offices before finally being turned over to the Smithsonian by President Dwight D. Eisenhower in 1958. The building was declared a National Historic Landmark in 1965. Renovation costs are always underestimated and this building was no exception! Originally estimated at $110 million to $120 million the final cost was $283 million. The center courtyard alone came to $63 million. To be fair, it came out great and Condé Nast Traveler magazine named the courtyard as one of the seven new architectural wonders of the world. Andrew W. Mellon (banker, oil/steel/shipping magnate, Secretary of the Treasury, art lover) donated his large collection of art to the United States (resulting in the development of the National Gallery of Art) and stated that if the United States were to ever build a portrait gallery that any of the portraits that he had donated were to be immediately turned over to it. If you are ever curious about a portrait, just e-mail the fine folks of the Portrait Gallery at NPGResearch@si.edu. They can provide you with tons of information that hides in the depths of the Smithsonian, portraits that aren't on display, and much more! The Portrait Gallery was kind enough to allow political comedian Stephen Colbert of The Colbert Report to hang his portrait in the Museum. Steps away from The President's Gallery ... next to the toilets. While interning with the Portrait Gallery I would usually take my lunches in the center courtyard or on the outside steps. The courtyard is amazingly serene and sometimes the fountains would be on, which was a nice touch. Oh, and if they still have it, I highly recommend the cafe's turkey cranberry sandwiches. They were my favorite. The National Portrait Gallery is a historic art museum located between 7th, 9th, F, and G Streets NW in Washington, D.C., in the United States. Founded in 1962 and opened to the public in 1968, it is part of the Smithsonian Institution. Its collections focus on images of famous Americans. The museum is housed in the historic Old Patent Office Building, as is the Smithsonian American Art Museum. The two museums are the eponym for the Gallery Place Washington Metro station, located at the corner of F and 7th Streets NW. Check out the full Wikipedia article about National Portrait Gallery (United States). The Handmaid’s Tale: Art History goes Atwood!